Manushi Chhillar, who won the Miss World 2017 and landed in Mumbai to a warm welcome, thanked fans for showering her with love. Some were quick to criticise stating that her victory would ensure the cosmetics market garner more money. Lakmé now having Shraddha Kapoor as ambassador, started as a 100% subsidiary of Tata Oil Mills (Tomco). It was started in 1952 famously, because the Prime Minister Jawaharlal Nehru was concerned that Indian women were spending precious foreign exchange on beauty products and personally requested JRD Tata to manufacture them in India. In 1996, Tata sold off their stakes in Lakmé Lever to HLL. The picture at the start is a painting by a French artist - Olaf Van Cleef. He was a jewelery salesman at Cartier for 33 years. Dutch, he lived for a long time in Paris then in Pondicherry . He started painting at a young age, his subjects are often Indian - portraits of Hindu Gods and Goddesses as well as scenes from Hindu mythology. Following a trip to Bhutan in February 2014, he directs his work on the Buddhist Bhutanese and prepared for two years an exhibition for the Museum of the Royal Academy of textiles at Thimphu. At the request of the Rajah Ravi Varma Foundation Heritage ( Bangalore , India) he embellished and enriched with Swarovski elements four reeditions of engravings by the painter Ravi Varma in order to "crystallize for eternity" four masterpieces of the deceased artist in 1906. A couple of months ago, in Chennai , he exhibited a collection of mobile phone covers, embellished with Swarovski crystal elements called " Be Cleef in Yourself " in association with the hotel 'Taj Coromandel, Swarovski India and Artworld India Gallery. 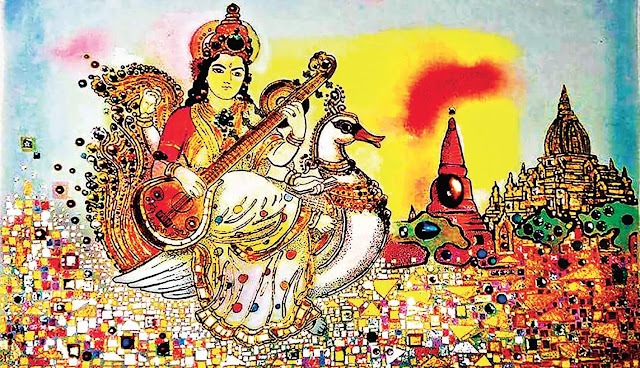 He claims that he was inspired after seeing some Thanjavur paintings and visiting the Taj Mahal with its beautiful semi-precious stone mosaic work. He comes from a family with a large culture for jewellery; worked in the high-end jewellery field for over 30 years and now uses precious stones in his paintings. Naturally the price is pretty high for these paintings. He has embellished some superb paintings of Raja Ravi Varma, bringing them back to life and embossing rare crystals and diamonds them, adding pristine beauty. Tailpiece : Lakmé is an opera in three acts by Léo Delibes to a French libretto by Edmond Gondinet and Philippe Gille. The score, written in 1881-2, was first performed on 14 April 1883 by the Opéra-Comique at the (second) Salle Favart in Paris. Set in British India in the mid-19th century, Lakmé is based on Théodore Pavie's story "Les babouches du Brahamane" and novel Le Mariage de Loti by Pierre Loti. The opera includes the popular Flower Duet (Sous le dôme épais) for sopranos performed in Act 1 by Lakmé, the daughter of a Brahmin priest, and her servant Mallika. The name Lakmé is the French rendition of Sanskrit Lakshmi, the name of the Hindu Goddess of Wealth. Like other French operas of the period, Lakmé captures the ambience of the Orient seen through Western eyes, which was periodically in vogue during the latter part of the 19th century. The Indian fashion brand Lakmé, established in 1952 by the Tata Group and now owned by Hindustan Unilever, is named after this opera. The way you explained about the paintings of the goddess Lakshmi is very useful and attractive. 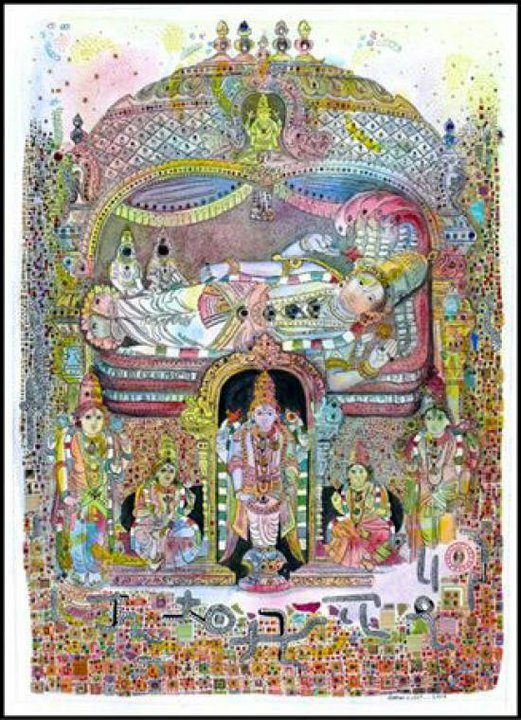 The paintings of Lakshmi is available in Thanjavur Paintings in Chennai.